Director/Writer: Adam Green / Cast: Danielle Harris, Tony Todd, Kane Hodder, Parry Shen, Tom Holland, R.A. Mihailoff, A.J. Bowen, Alexis Peters, Ed Ackerman, Colton Dunn, David Foy, Rick McCallum, John Carl Buechler. Vegan Voorhees’ first world premiere! Yay! I realised I hadn’t been to FrightFest for a decade – my last foray was for Cut, the Molly Ringwald/Kylie Minogue Australian answer to Scream, which disappeared without a trace thereafter. Once settled in the back row, a camera flash caught my attention and I heard the signature purr of Tony Todd’s voice all but ten feet from me – “we’re saving this seat for Adam,” said a small dark-haired girl to his left – Danielle Harris! 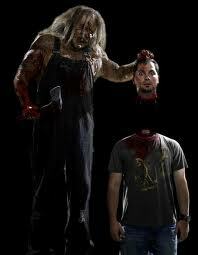 And a couple of seats closer, do I see the outline of Kane Hodder’s head? OK, so I’m way too shy to approach but Adam Green gathered the group to the stage after the film for some Q&A and, on his own, introduced the film. He’s a genuine guy and evidently a gem to work with as his entire crew returned to work with him on this sequel to a film I’ve never really thought that much of, therefore my expectations for more of the same weren’t exactly high. Lo and behold…Green’s preamble that his growth as a director has provided a positive knock-on effect for the end product and it’s true, he has surpassed his first effort. It’s a rarity in the slasher realm for a sequel to actually pick up where its predecessor left off and Hatchet II begins with Marybeth fighting off Victor Crowley after he grabbed her from the boat. She escapes and is rescued by returning character, Jack Cracker, who, upon realising what family she’s a part of, boots her out and sends her in the direction of Reverend Zombie. Tony Todd relishes narrating the backstory of Victor Crowley, going further back than before and therefore permitting Kane Hodder some dialogue as Crowley Sr. as we learn of the curse that was beset on the unborn child, giving some origin to his apparent ongoing survival, and providing space for a quick ‘greatest hits’ style montage of some of Crowley’s kills. Zombie agrees to accompany Marybeth back to the swamp to recover the bodies of her father and brother as long as she brings along her Uncle Bob and they go with a group of local croc hunters and fisherman, who are competing for $500 bounty on Crowley’s head, including the twin brother of phoney tour operator Shawn (again played by Parry Shen – this time affecting a rubbish French accent), an estranged couple who can’t keep their hands off each other, and every-line’s-a-gag guy Vernon. Up to this point, the film kinda drags its feet, devoting more screentime to Harris and Todd and the film is almost half over by the time the group get back to the bayou. The big dude quickly appears once the hunting party separate and so begins the carnage and Green has gone all out on a parade of dementedly twisted – and often hilarious – slayings: faces go into outboard propellers, there was quite possibly an axe up the arse and the world’s most phallic chainsaw makes an appearance, as does the power sander used in the previous film and there’s a great tabletop decapitation that had the whole audience applauding. Almost everything works better this time round the carousel: Crowley’s make-up appears less rubbery and Danielle Harris makes a more appealing Marybeth, simply by the virtue of who she is. Green stated that his entire crew returned for the sequel, which had sets built by the same team from The Dark Knight and told of an E. Coli outbreak that attempted to wipe out most of the cast and crew throughout the shoot. The dedication of the team allowed for amusing cameo appearances from Mercedes McNab and Joleigh Fioravanti via the recovered camcorder brandished by the amateur pornographer from part one and listen out for the mention of Leslie Vernon during Zombie’s pitch to the hunters. 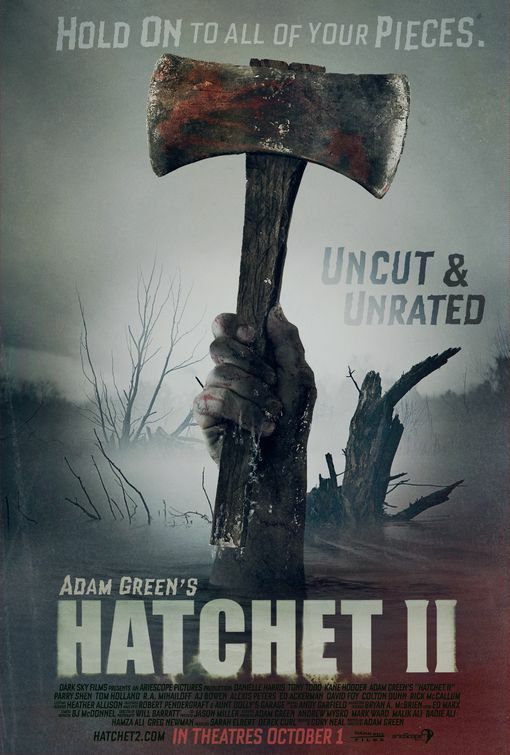 Bottom line is that Hatchet II just works better, scoring high points for striking its comedy-horror balance, assembly of genre faces and the apparent love all involved had for the project. Blurbs-of-interest: Danielle Harris played Jamie Lloyd in Halloween‘s 4 and 5 and Annie Brackett in Rob Zombie’s remake and its sequel as well as Urban Legend; Tony Todd was also in iMurders, Scarecrow Slayer, Jack the Reaper, Hell Fest, and the first two Final Destinations; Kane Hodder played Jason four times and appears fleetingly in Behind the Mask: The Rise of Leslie Vernon and Children of the Corn V. Parry Shen was in Dead Scared. R.A. Milhailoff was in Texas Chainsaw Massacre III. A.J. Bowen later in appeared in You’re Next. yeah, I can’t wait how they’re gonna follow-up with that ending.